Domestic workers perform work within their employers’ households, and provide services such as cooking, cleaning, child-care, elder care, gardening and other household work. Domestic workers may or may not live in their employer’s homes. Victims of domestic servitude commonly work 10 to 16 hours a day for little to no pay. Domestic workers may be U.S. citizens, undocumented immigrants, or foreign nationals with specific visas types. The following visa types are common: A-3, G-5, NATO-7 or B-1. Victims of domestic servitude in the U.S. are most often foreign national women with or without documentation living in the home of their employer. Men and boys may also be victims, but these cases are less common. Force: Physical and/or sexual abuse; restrictions on movement; restricted communication with family or friends; constant surveillance; lack of treatment for work related injuries, sleep deprivation. Fraud: False promises of a different job; false promises of educational opportunities; non-payment, underpayment or wage theft; visa fraud; false or altered contracts. Coercion: Threats of harm to victim’s family or friends; debt manipulation; threats of deportation; ; document confiscation; pattern of verbal or psychological abuse design to elicit cooperation. Immigration Status – The National Domestic Worker’s Alliance reports that 65% of domestic workers in the United States are immigrants or people of color. Many victims of trafficking in domestic work are recruited by traffickers, and often trough family or community ties. Once in the United States, traffickers often use the threat of deportation as well as document confiscation to maintain control of foreign national domestic workers. Some domestic workers hold special visas which tie their immigration status to a single employer. If a domestic worker with an A-3, G-5 or NATO-7 visa leaves an abusive situation, he or she becomes undocumented and risks deportation. Traffickers frequently use victims’ unfamiliarity with U.S. laws and customs to make them believe there is danger in reporting their trafficking situation to law enforcement or seek help from social service providers. Exclusion from certain labor laws – Domestic work is particularly vulnerable to exploitation due to their exclusion from federal laws governing overtime pay, a safe and healthy work environment, workplace discrimination, and the right to organize and bargain collectively. Recently, some states have stepped in to cover gaps, passing domestic workers’ rights laws. Isolation – By definition, domestic work occurs within the confines of a residential home. Victims within domestic work may have extremely limited or monitored interaction with others in the community, such as neighbors, school staff, or postal workers. The NHTRC has received calls from domestic workers were required to live in their employer’s home and never left the premise of the residence. This level of isolation can be exploited by employers who proactively seek to limit victim’s interactions with the outside work and limit access to technology. 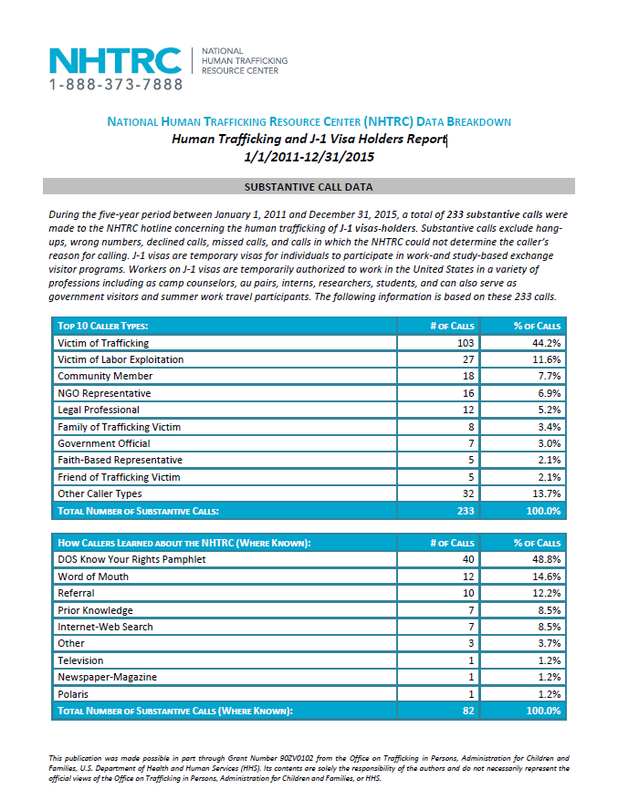 During the four-year period between January 1, 2011 and December 31, 2014, the NHTRC received a total of 725 calls from domestic workers identifying as victims of human trafficking.